The Candela SmoothBeam laser machine is a compact and powerful system that is specifically designed for acne treatment. It uses a 1450 nm diode laser to target the sebaceous gland, which is the root cause of acne. This model can also be used for skin rejuvenation and wrinkle reduction. Not only does the Candela SmoothBeam laser system prevent acne, it also treats the damage left behind by acne. It has Candela’s DCD cooling system for maximum patient comfort, and it is available with a surprisingly low price tag from SunrayLaser.com. We have used Candela SmoothBeam laser machines for sale, and we guarantee your total satisfaction. At just 40 pounds, it is easy to transport a pre-owned Candela SmoothBeam laser machine between treatment rooms or between different office locations. And because it uses standard 115 VAC power, you can plug it in just about anywhere. If you don’t currently offer acne treatments, the purchase of used Candela SmoothBeam laser equipment will allow you to add a new revenue stream to your business without having to make a major capital investment. We know that you might have a few concerns about buying a used cosmetic laser machine online. That’s why we only sell quality pre-owned systems that meet our high standards for quality. Plus, we offer a 100% satisfaction guarantee with every unit we sell. 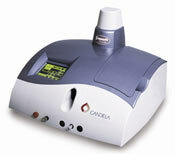 Contact us right now for pricing information on a pre-owned Candela SmoothBeam laser system.